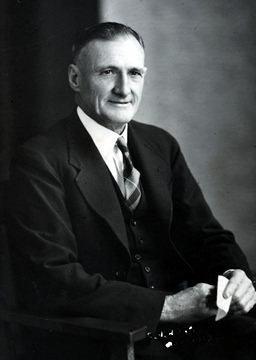 Benjamin Courtice, Bundaberg canefarmer who became federal minister for trade and customs, was one of a large number of Queensland small sugar farmers who, early in the twentieth century, replaced the non-white labourers of the South Pacific and found a strong political voice in the Queensland Labor Party. Francis Courtice, a labourer, and his wife Elizabeth, née Hamilton, both English-born, arrived in Townsville, Queensland, in 1879 with three of what would become a family of twelve children. They moved to Bundaberg, in the heart of sugarcane country, where, on 28 March 1885, Benjamin, the sixth of the twelve, was born. Ben, as he was known, attended Bundaberg South State School, leaving at the age of twelve to begin work as a ‘laboratory boy’ at the Millaquin sugar refinery, and going on to become a sugar boiler. His commitment to the labour movement was established early in life. In 1905, with his brother Fred (later a Queensland MLC), Ben was a prime mover in the formation of the Bundaberg and District Workers’ Union—by 1910 the Bundaberg branch of the Sugar Workers’ Union, which later amalgamated with the Australian Workers’ Union. By 1910, when Ben Courtice married Bertha Demaine, he was describing himself as a sugar planter, living in Barolin Road, Bundaberg. Bertha, born and brought up in Maryborough, was the daughter of a journalist. Bertha and Ben were married, in accordance with the rites of the Methodist Church, at the Demaine residence in Sussex Street, Maryborough. Bertha died in 1925, leaving four children of the marriage. Through the 1920s and 1930s Ben became prominent as a citizen of Bundaberg and as a representative of the sugar industry, which by then Queensland governments were protecting as the state’s most valuable agricultural asset. In the 1920s he and Fred bought a sugar farm at Sunnyside Plantation, Windermere Road, Bundaberg. Ben went on to acquire other properties, one in partnership with another brother. In 1925 Courtice was active in the formation of the Queensland Cane Growers’ Association and from 1930 to 1938 was a member of its council. From 1926 he was a member of the executive of the Millaquin Mill. In 1933 he was appointed as one of the two canegrowers’ representatives on the first Sugar Experiment Stations Advisory Board, established by the Queensland Government. On 13 June 1936 he married, at St John’s Church of England Cathedral, Brisbane, Elsie Dora Maud Joyner, a nurse, and the daughter of a grazier from Samson Vale. On 27 June the Queensland Government Gazette announced Courtice’s appointment as chairman of the Bundaberg Hospitals Board, a position he held for five years. On 2 September 1937 Courtice was appointed to fill a casual vacancy in the Senate caused by the death on 17 August of J. V. MacDonald. Courtice’s subsequent success at the election on 23 October enabled him to fill (under existing electoral legislation) the remainder of MacDonald’s term prior to the commencement of his own six-year term in the Senate on 1 July 1938. He was re-elected on another four occasions. Though somewhat retiring, he impressed his colleagues with his administrative ability, capacity for hard work and integrity. During his twenty-five years in the Senate Courtice would see the desertion of Labor by Joseph Lyons and the rise of the modern Liberal Party. He would see Labor at its greatest under John Curtin and Ben Chifley, but would be again on the Opposition benches during the long reign of R. G. Menzies. Not at first a prolific contributor to Senate debate, Courtice developed into a regular and thoughtful speaker in the chamber, well regarded, it seems, by both Chifley and Menzies. He was a devoted regional representative, maintaining his commitment to the sugar industry throughout his career, and a man of such political principles as to become a stalwart of the Federal Parliamentary Labor Party. He did once confess to having ‘very nearly’ become a member of the Australian Country Party, but realised it was concerned with powerful interests, not ‘dinkum farmers’. His recurrent concern was with the primary production integral to his state’s economy though his support of secondary production was much to the fore—another point on which he disagreed with the Country Party. He was really a centralist. Occasionally eloquent, he argued for ‘a Commonwealth in reality’, and quoted Henry Parkes on Federation. He saw the need for the Commonwealth to be ‘clothed’ with the power necessary for it to tackle financial and health issues. He regarded cooperation between the Commonwealth and the states as vital for postwar reconstruction. Courtice was the sort of reliable performer who could be trusted to do what was required, as with Chifley’s Committee on the Income Tax Assessment Bill (No. 2) and the War-time (Company) Tax Assessment Bill, of which he was a member. Here he was in company with such luminaries as Chifley himself and also Menzies, J. H. Scullin and P. C. Spender, as well as A. W. Coles, E. S. Spooner and Senator J. A. Spicer. He served on a number of parliamentary committees, the most significant being the wartime Joint Committee on Profits and the Regulations and Ordinances Committee. He was also a member of the all-Labor Select Committee on the Constitution Alteration (Avoidance of Double Dissolution Deadlocks) Bill. This experience would further his parliamentary career. In November 1946 he joined Chifley’s second ministry as Minister for Trade and Customs. Chifley is said to have told a senior public servant appointed to be Courtice’s private secretary that Courtice ‘was a man of shining honesty’ whose ‘integrity was to be protected by the most efficient Public Servant available to serve him’. As the remark implies, Courtice, though he proved a loyal, hard-working and competent minister, was not one likely to achieve a national profile. Nevertheless, his experience in the practicalities, organisation and politics of the sugar industry and the high regard in which he was held in his own state, made him a sound choice as one of the two Queenslanders in the ministry. As minister, he made many statements relevant to the easing of rationing and wartime controls. In January 1947 he promised to end sugar rationing once the fruit processing season ended. While in February there seemed no early end to tea rationing, by July fewer coupons would be needed for men’s suits and women’s dresses; and soon supplies of Australian-made corsets would be available. While appealing for Australians to eat less meat so that more could be sent to Britain, Courtice announced, in August 1947, the resumption of trade with Japan, and in September the abolition of the wartime company tax. In April 1948 price controls on lamb were lifted, no doubt to the meat unionists’ satisfaction, though in June 1949 Courtice was obliged to announce that tea and butter rationing would continue. When the May 1948 referendum, which would have given the Commonwealth power to continue wartime controls over rents and prices, failed, Courtice said he wasn’t surprised, the people had been ‘shamefully bamboozled by the Press and radio’. Despite being placed third on the party ticket, Courtice was re-elected at the December 1949 election at which the Chifley Government was defeated; he was now a shadow minister. Towards the end of his parliamentary career, Courtice commented: ‘I was a farmer before coming to a better plot in here’. He seemed to have tended his plot well. Besides being a minister, he had served as a temporary chairman of committees from 1941 until 1943, followed by Chairman of Committees until 1946, and between 1953 and 1954 was a temporary chairman of committees again. In 1955 he was a member of the federal delegation to the opening of the Legislative Council chamber in Darwin, at which a replica of the President’s Chair in the Senate was presented. More significantly, in 1950 with Senator Morrow and Senator Ward, he was one of three senators who refused to follow Chifley’s direction, reluctantly given after a Federal Executive ruling, to vote for the Communist Party Dissolution Bill. He chose not to stand for the 1961 election, leaving the Senate at the end of his term on 30 June 1962, and retiring to live in Bundaberg and Brisbane. In 1958 Menzies had invited Courtice to join him on one of the Liberal Party’s ‘meet the people’ tours in Queensland. Strangely enough, this elder statesman of the Labor Party obliged! Ross Fitzgerald and Harold Thornton, Labor in Queensland from the 1880s to 1988, UQP, St Lucia, Qld, 1989, pp. 90–1; Elaine Brown, ‘Courtice, Benjamin’, ADB, vol. 13; Bundaberg Genealogical Association (comp. ), Bundaberg and District Pioneers: A Biographical Index to 1901, Bundaberg, Qld, 1988, p. 21; Bundaberg News-Mail, 23 May 1967 (supp. ), p. 10; Australian Sugar Journal, Jan. 1972, p. 497; John Kerr, Southern Sugar Saga: A History of the Sugar Industry in the Bundaberg District, Bundaberg Sugar Company, 1983, p. 71; Minutes of Amalgamation Conference between AWA, ASWU, AWU and WWA, N117/1475, item 106, Noel Butlin Archives Centre, ANU. Kerr, Southern Sugar Saga, pp. 71, 103–4; Australian Sugar Journal, Jan. 1972, p. 497, 5 June 1930, p. 184, 7 Jan. 1926, p. 666; Queensland Cane Growers’ Association, Twelfth Annual Conference: Verbatim Report of Proceedings, Brisbane, 1938, pp. 17–18; Queensland Government Gazette, 27 June 1936. Senate, Journals, 24 Aug. 1937, 7 Sept. 1937, 30 Nov. 1937; CPD, 16 May 1940, pp. 870–3, 13 Oct. 1949, pp. 1386–90, 2 Oct. 1957, pp. 294–9, 29 June 1943, pp. 499–505, 2 Dec. 1937, pp. 97–9, 30 Sept. 1943, pp. 202–3, 3 June 1942, pp. 1940–3, 10 Dec. 1940, pp. 646–50, 3 July 1941, pp. 813–14, 22 & 23 Mar. 1944, p. 1839. Senate, Journals, 29 Sept. 1942; Joint Committee on the Income Tax Assessment Bill (No. 2) and the War-time (Company) Tax Assessment Bill, report, 1942, Table Office, House of Representatives; CPP, Joint Committee on Profits, reports, 1941, 1942, Select Committee on the Constitutional Alteration (Avoidance of Double Dissolution Deadlocks) Bill, report, 1950. SMH, 1 Nov. 1946, p. 1; Australian Sugar Journal, 15 Nov. 1946, pp. 380–1; Courier-Mail (Brisb. ), 8 Jan. 1972, p. 2; Letter, President of the Senate, Magnus Cormack, to Courtice’s daughter, Mrs E. Clay, 23 Feb. 1972, Senate Registry File, A8161, S61, NAA; DT (Syd. ), 9 Dec. 1946, p. 7; SMH, 30 Jan. 1947, p. 1, 18 Feb. 1947, p. 1, 1 July, 1947, p. 1; DT (Syd. ), 24 Sept. 1947, p. 7; SMH, 28 June 1947, p. 3, 5 July 1947, p. 5, 23 Aug. 1947, p. 1, 4 Sept. 1947, p. 1, 17 Apr. 1948, p. 1, 23 June 1949, p. 3; DT (Syd. ), 31 May 1948, p. 5, 26 June 1949, p. 30; SMH, 17 Feb. 1959, p. 1. CPD, 26 Feb. 1959, p. 214; SMH, 24 Mar. 1955, p. 4, 19 Oct. 1950, p. 1; CPD, 21 June 1950, p. 4595, 17 May 1962, pp. 1530–5. SMH, 8 Jan. 1972, p. 2, 12 Jan. 1972, p. 10; Courier-Mail (Brisb. ), 12 Jan. 1972, p. 8; Information on the family provided by Mrs E. Clay and Mr Brian Courtice, Courtice file, ADB, ANU; CPD, 22 Feb. 1972, pp. 3–6; DT (Syd. ), 31 May 1958, p. 9; Worker (Brisb. ), 7 July 1958, p. 5. This biography was first published in The Biographical Dictionary of the Australian Senate, vol. 2, 1929-1962, Melbourne University Press, Carlton, Vic., 2004, pp. 363-366.